Magnificient 7’s is Saucify’s way of offering a slot machine which is inspired by the 1960 film called The Magnificient Seven. The movie was adapted from Seven Samurai, and turned into a Western where 7 gunslingers were hired to protect a village from the raids of bandits. The slot machine which was inspired by the movie looks very good for a classic title, which this is, based on the number of reels and most of the symbols used. 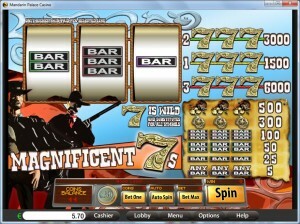 This classic Western slot has 3 reels with 3 paylines on them. You can win $6,000 by playing it, and you also get some basic wilds to help you out along the way. A single feature symbol is present in the game, a wild 7 which is beautifully decorated. As the wild, the 7 symbol can land on a payline and be able to help you form another combo. You can use it together with two matching icons, or you can use two wilds with one regular symbol, and either way you get a prize out of it. Three wilds do even better, forming their own combo on the payline and paying between 1,500 and 6,000 coins. The exact line on which the combination forms will decide how much money you get. The game has 3 lines, and you can bet a single coin on each one. The coins are of relatively low value, only reaching $1 when they’re at their maximum level, where the total bet is at $3. If you get the combo of three wild 7s on the same line, you will get paid one of the slot’s best prizes. The first line pays 1,500 coins, the second one 3,000 coins, while the third line awards 6,000 coins ($6,000). The design is superior to 90% of the classic titles which are on the market. The Wild West influence is visible in many of the symbols, but in the background graphics as well. You see two of the gunslingers there, dressed in black, wearing hats and armed with rifles and pistols. The reels are encased in rope like borders, with the paytable showing half of the symbols themed, the rest as classics. Symbols: Seven (6,000 coins, wild), Gold Nuggets (500 coins), Badge (300 coins), Three Bar (100 coins), Two Bar (50 coins) and One Bar (25 coins). 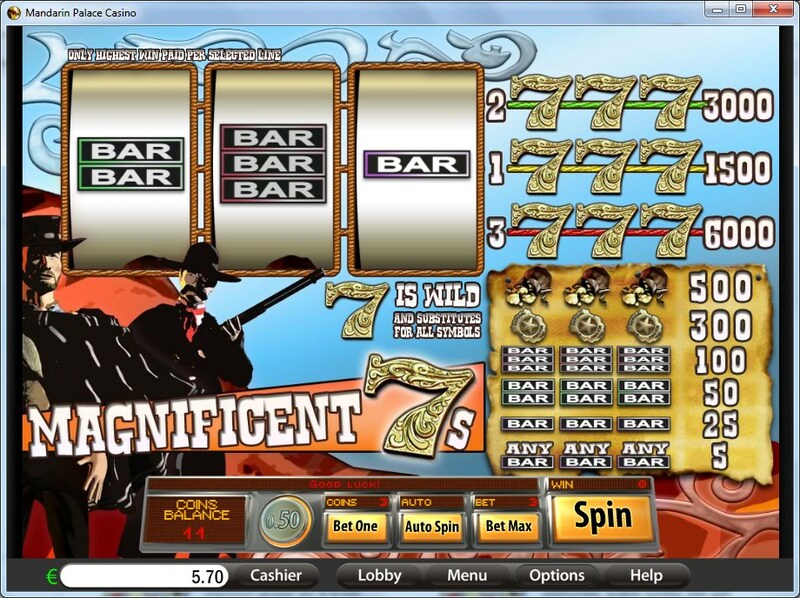 It’s the right game to play if you love Western movies, but in every other way it’s just like any other classic slot. Magnificient 7’s can be found at any Saucify/BetOnSoft casino, where you get a chance to play it for real money or in free mode.